We’ve been hearing from CMOs how hard they struggle to convey the value of inbound marketing. Despite their many successes, they express frustration in getting their message across to the C-Suite, and CFOs in particular. They asked for resources to help make a business case for inbound. A case that the C-Suite would hear, get excited about, and endorse. Devour this pocket guide. Build a presentation with your own firm’s data and perspective. When you’re done, we bet your C-Suite will finally “get” the value of inbound marketing. And you’ll finally be able to implement your inbound marketing vision. With inbound, everything’s digital and its analytics play a major part in attributing dollars spent to revenue generated. Today, with some companies spending as much as 10% of their annual budgets on marketing, putting hard numbers against marketing performance is music to the C-Suite’s ears. That’s inbound marketing’s strength. That’s the key to opening the C-Suite’s minds and winning their support. It’s easy for us to get wrapped up in our own responsibilities and forget to walk a mile in someone else’s shoes. And the more alien their perspective the harder that can be to do. So although you and your CFO share similar pressures, she has profit and growth objectives for the company, with a finite budget. And she still needs to get ROI from the firm’s investments. Find opportunities to get to know your CFO better. Ask about what issues she’s up against in that moment. Pay close attention to what she says. Ask questions to learn more and to show you’re paying attention and are truly interested. It will become easier to create an authentic connection with her when you come to understand her concerns, and learn about her on a more personal level. More importantly, you’ll learn what her hot buttons are, what matters most to her. As you become more adept with the financial terms we’ll discuss in a bit, you’ll find it easier to help her understand what you’re doing in marketing, how that relates to company performance, and why she should care. Prove that a dedicated approach to inbound can provide greater returns. Show that the longer you wait to do it, the longer it will take to get those results. 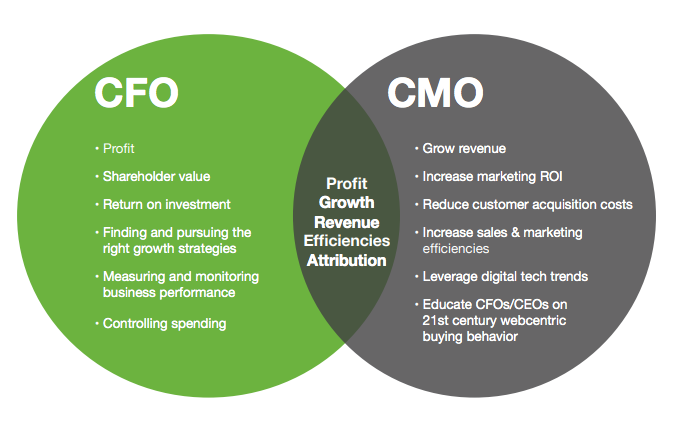 CFOs are all about the data and measuring results. They look to marketing to add to the company’s bottom line in an easily attributable, predictable, and efficient way. (Those are the reasons why PPC advertising often makes sense to them.) We’ll talk more about this later. Build your partnership on inbound marketing increasing profits and revenues through greater efficiencies because inbound marketing is measurable, predictable, and attributable. For Marketing and Finance to become true partners and build trust, you must speak a common language. Explain marketing concepts using financial language your CFO understands. Understand and be comfortable discussing the high level goals and metrics you should share: e.g. LTV, CAC, MQLs/month, and ROI. If you can’t frame tactics to show how they directly connect to financial gains, you’ll lose credibility — and maybe even budget. Your CFO is focused on safeguarding the company’s future. She’s focused on watching the money and helping the company become more valuable. Her language doesn’t include marketing terms such as brand awareness, impressions, or followers. If anything, the moment you use those terms, you’ll put her on edge because she can’t figure out how to attribute those terms to how profits, revenue, and growth are generated. As you know, C-level relationships work best when there is open and direct communication. You can build mutual respect by looking for ways to help each other. You’ll win your CFO’s confidence and respect when you identify and track metrics for Marketing that your CFO can directly attribute to profits and revenue. This is where you’ve been struggling. No longer. With inbound marketing, you’ve got hard data. You can create predictable models with it. Attribute (— aka “track”), measure, analyze, and improve. You can show how marketing adds value to the company’s bottom line. Compound interest is interest added to the principal of a deposit (or loan or credit card) so that the added interest also earns interest from then on. The compound interest effect is a powerful concept you can use to describe the long term benefits of a successful inbound marketing plan. As we continue to do inbound marketing month after month, it’s as though we’re making deposits to different savings accounts. The savings accounts are held by Google’s search engine and various social media networks. Our deposits are the assets we create and publish (blog and other content, including processes, systems, and workflows). Our assets constantly earn interest, which shows up as higher search engine rankings and ever-growing social media networks that share our assets widely. They in turn provide us with on-going income in the form of traffic and leads that we nurture until they’re ready to hand-off to sales. The first month of inbound, we may only do one blog post, that attracts 20 new followers on social media, and generates 10 leads. The second month, we may publish two more blog posts, add two content offers, attract 40 new followers, and increase our search engine ranking for eight keywords, and generate 20 leads. By the sixth month, we may have published a total of 30 blog posts, created 10 content offers, have a total of 200 followers, and are showing up on page one of Google for five keywords, and generated 100 leads. The compound effect from creating those assets over time didn’t just double the leads the second month, they generated 10x the results in only a few short months. Of course, the exact numbers you use will depend on where your firm is starting from (traffic, content, social media network size, etc. ), how much content you’re producing and how quickly, the competitiveness of the keywords you choose, the value of your content offers, and your conversion and close rates. Use a ROI Calculator to help you gauge the average results for traffic, leads, and customers you can expect based on the 13,500 customers that use HubSpot. 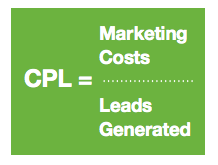 CPL is how much you spend to acquire one lead. Divide marketing costs by total leads generated. Marketing costs and leads can be as granular as a specific asset or campaign, or based on all costs and leads in a particular time period. Here are our suggestions for describing inbound marketing using familiar financial terms. CPL shows how cost-effectively you invest marketing dollars. The more granular you get (e.g. content, landing page, CTA, campaign, etc. ), the faster you can determine which ones are more effective. Tracking CPL also helps you continuously improve for greater efficiency. CPL can also help isolate which assets are better at converting leads at the different stages of the marketing funnel. CAC is total sales and marketing cost divided by the number of customers acquired, over a specified period of time (a month, quarter, or year). If you spent $300,000 on Sales and Marketing in a month and added 30 customers that month, then that month’s CAC is $10,000. 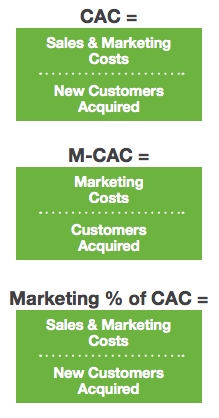 Also calculate marketing CAC (M-CAC) and Marketing’s percent of CAC. M-CAC and Marketing % of CAC tells your C-suite how (much more) efficient and effective inbound marketing is at delivering qualified leads to Sales than traditional marketing. As you begin to reallocate budget from traditional marketing to inbound, M-CAC will eventually decrease because inbound brings in more qualified leads at a lower cost. LTV is one of those metrics that keeps your CFO up at night. It’s the estimated revenue that a customer will generate during the entire span of their relationship with your company. Precisely how it’s calculated depends upon your company’s business. A SaaS company will be different than a consulting firm or semiconductor manufacturer. Meanwhile, on the right is a quick back of-the-envelope formula. Whatever formula your company uses, LTV provides a good indication of the maximum amount your company should invest in CAC. 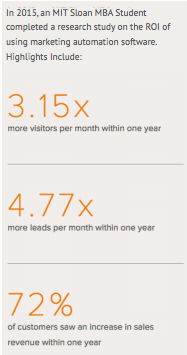 The reality is that inbound marketing isn’t instantaneous, but you should see significant results in about six months. PPC is the equivalent of renting space (on someone else’s website). You don’t own that space and you have to keep competing for it (pay more to stay in that same space). Your CFO hates to rent assets because rented assets don’t generate long-term value. And in PPC’s case, it can increase in cost daily, if not hourly, to generate the same number of leads. As soon as you stop spending money on PPC, the leads stop immediately. Whereas with inbound marketing, its assets keep on producing traffic and leads, long after those assets were created. Inbound marketing opens up new markets because the assets can be found, shared, and passed along — forever. Think of PPC as a lead factory you rent. 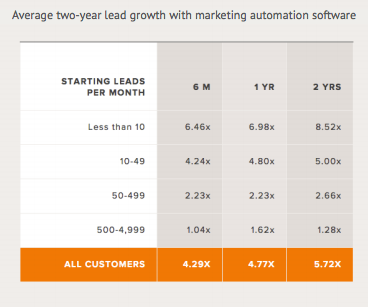 Whereas inbound is a lead factory you build, own, and can resell with the company. Below are common objections to inbound marketing we’ve heard from other CMOs and CFOs. The presentation should pre-empt most of these objections. However, before giving your presentation, we recommending reading through this Q&A below and make any necessary edits to your slides. Why Should We Do This And Why Now? 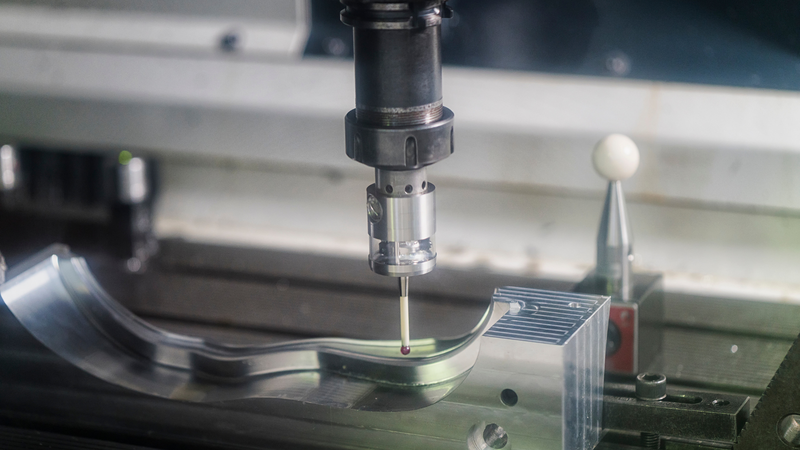 Inbound marketing builds a lead generation factory. We create assets we own that keep delivering value forever with no additional investment. 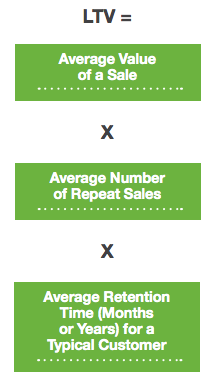 Although it takes longer than PPC to ramp up, IM delivers a consistently higher ROI. As with all assets, it takes time to build them, so the sooner we get started, the sooner we’ll get a return. If PPC Ain’t Broke, Why Fix It? PPC has an important place in our overall marketing mix. However, we don’t want to become overly dependent on PPC. PPC is not an investment. It’s pure expense. In fact, PPC can be extremely volatile depending upon how competitive keywords become. We would either hold spending steady, and get fewer leads, or have to increase spending to get the same number of leads. If we ran out of money for PPC, leads would dry up. With inbound, the more assets we build over time, the easier we can withstand any budget crises with minimal harm to our lead generation factory. How Reliable Is This Strategy? The methodology has been proven. The system works. We need time to put content, processes, and workflows into practice and gather our own data. With enough trend data, we will be able to consistently execute and deliver results based on data-driven formulas. How Predictable Is This Strategy? / What’s The Expected ROI? We’ve already had sufficient experience with the methodology to see that (whatever you’ve experienced). Yes, we’ve been testing pieces of the methodology for (period of time). But we’re being less efficient than we could be. Time to bring it all together in a cohesive strategy, streamline processes, and really drive results. Can We Produce Enough Content That People Would Be Interested And Even Read It? Do We Have Enough Interesting Things To Say? How Long Before We See Results With Inbound Marketing? We estimate six months before we have significant results. It will take somewhat longer before we see reliable and predictable data we can confidently use to accurately predict future marketing performance. Yes, it works outside the U.S. The methodology has been widely adopted throughout the EEU and Canada. When you build your presentation do not go into too much detail with your CFO. You’ll distract him from where you want him focused. We already know you’re a good presenter. The most successful presenters practice. 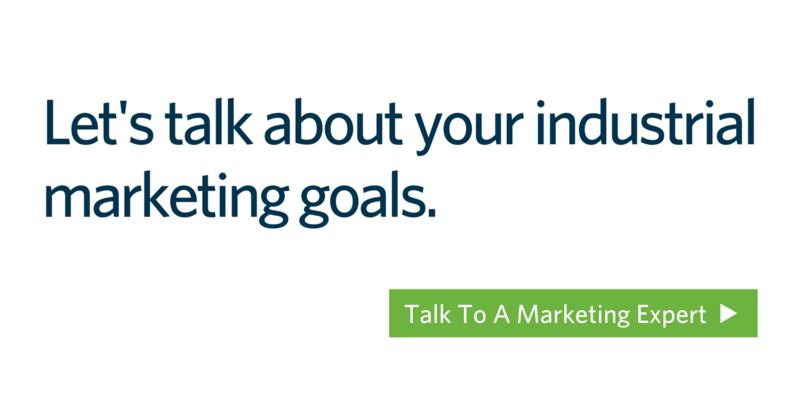 Use those terms casually in conversation to explain inbound marketing to friends and colleagues who are financially / numerically savvy. Get comfortable with them. 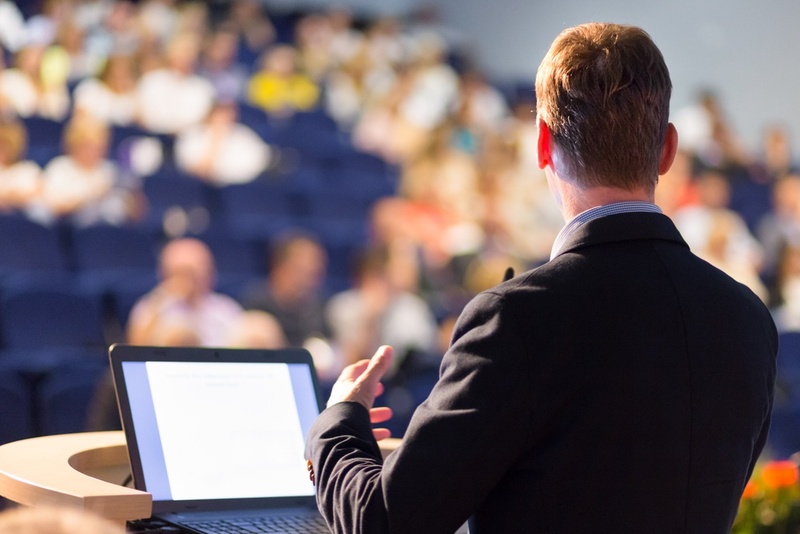 Practice presenting your deck out loud several times with a constructive audience. 6. Open the champagne and celebrate! Don’t forget we can help, you don’t have to go it alone. Ask one of our team members about our professional services.